Has anyone tried using the Hero Session for spearfishing, if so how was the quality and is there anything I should get for it? 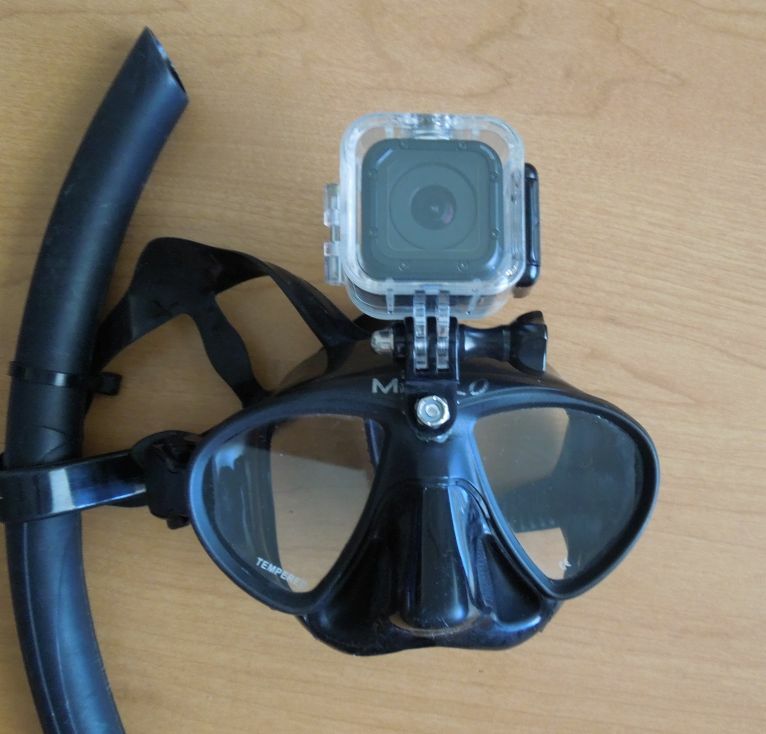 This is a less than 100$ go pro knockoff mounted on mask. Vis was about 8 ft. I have one of them box's. Sessions 5. One issues is the thing doesn't turn off. It has been an issues for many people. It just runs until the battery is dead. Lame. Now for under water, it was worked pretty well, nothing amazing as it is a small cheap camera with a trendy name. But the size is great and fits really nice on the gun with hunting rifle gun mount I found on ebay. I have added on a 52mm aluminum adapter ring to retro fit larger lens, but looks like I am looking down a long tube. How deep have you used the Session 5? I read it's only rated to 30' or something and GoPro doesn't make a housing for it. I've used it snorkeling/lobstering up to 20 ft without a housing, and it was fine with that depth. The underwater sound is best with no housing. Here is an example video without a housing. I was worried about scratching the lens putting my head into lobster holes, so I did get a housing. First I got this one which has a glass front. It shattered when I dropped it 2 feet after the second time using it. I then got this one which is all plastic. I've used it a half dozen times now and I like it. Here is an example video in that housing. You still hear things fairly well, and video quality seems the same. I'm not sure what alldayreese means. This camera starts and stops recording when you hit the top button. I turn it off and on easily while freediving. I can hear the beeps that tell you if it is on or off (in case I forget and don't want to remove my mask to look). It works great. The main negative I see is the battery life is not great, and you cannot remove the battery to pop in a spare. Mine gets 1:45-2 hours life. When it is dead, it can only be charged by USB. Last edited by Jason7654; 03-22-2017 at 12:03 PM. Well the thing is, the camera stays on even when the screen is turned off ( sleep mode) The camera is still running. You should make sure to turn off the wifi also. It isn't your battery life, it is actually just powered on and stays on till the battery dies. Well if the battery days the same day of use, then the camera isn't turning off. But if you get multiple days of use out of a single charge then most likely it isn't an effective unit. It's a common issue, the issues is all over the net. Everyone seems to be returning them back. Last edited by alldayreese; 03-22-2017 at 03:47 PM. I looked into it, and there is apparently some problem with the Hero 5 session, not mine. More info here. It looks like there are some workarounds for people with it. What Dive housing are you currently using? my first session took some water in @ 20' of water while snorkelling with my GF. They sent me a new one. I'm now using the new one with a waterproof case. It works great. It's simple. Good job for the Sheephead. Regarding the camera though, It seems a bit blurry and very very green. I use a gopro silver 3+ and I am annoyed with the greenish tint. I started to look up to the new gopros, but here I see that the new Hero Session is no better than the 3+. Alright I got a magenta filter that is supposed to fix that, I haven't tried it yet in a real dive, but I assume that it works at the cost of dimer light, since it is a filter. The movie I linked above is already a bit dim for my taste. The sky was overcast by the way. Anyways, I'd hate to shoot in low res at 720pixels to get more light through the filter. Anybody with experience with the magenta filters ? is it worth it ? blurry because vis was lousey. I like the sj4000 camera less than $100 made about 50 dives with it average 50 to 100 ft. Not a drop of water in it yet. Just went and looked at video. That day 10 ft and clowedy at best. At 10 feet or less there is no problem with color balance. It is just surprising to see that much green starting at 15ft. Anyways, the magenta filter is suppose to fix that. Surface shooting will be ruined by the filter, but that's the price to pay. I'll see. Too bad there is no 'deep water' settings for the color balance.